“Fortune Brawling” by Hunter S. Jones and Jennifer Theriot is a very well written and entertaining short novel. 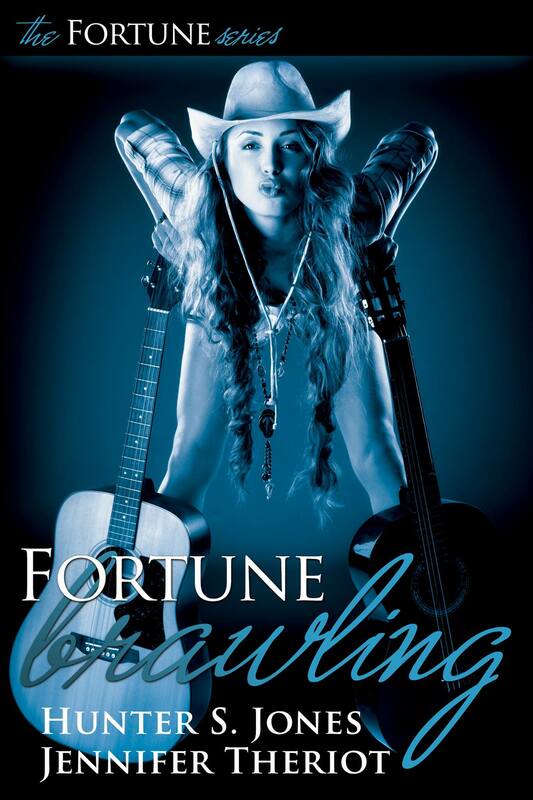 The Fortune-series is about musician Dallas Fortune. In this book she gets into trouble (again) when a wild night with friends and groupies gets a little out of hand. As you’d expect, drink and partying are involved, since this is the the music scene of Nashville Tennessee and features a few more southern states characters. You can’t help but laugh at the ‘misfortunes’, the banter, the complications and the honky tonk. The book takes a humorous approach and it’s difficult not to get involved in the story and the characters as the events unfold. A great story told with love for music and musicians, lighthearted and fun and some excellent characterisations make this a very enjoyable experience to treasure. If you’re wondering where all the fun has gone – in books or in your life – then read this. Well done to the authors for such a refreshing and entertaining delight. The Fortune Series, Story 2 The Story of Dallas Fortune. Two guitars. Two wild women. One crazy honky tonking night in Georgia. The Ace is high and the Joker is always wild. In story two of The Fortune Series, we find country musician Dallas Fortune in a tight spot. Guitar God, Billie Joe McAllister, has betrayed her once again. As if by magic, her BFF from Ft. Worth Texas, guitarist Jodie Marie Jennings, drives all night to come to her aid in a time of need. What happens at Bud’s honky tonk in Trenton, Georgia should stay at Bud’s, but it doesn’t. What went wrong? Who gets in trouble and who gets revenge? Who are JD Fowler and Tom Vanderfleet? What does the best fairy godmother in Country Music history do to save the day this time around? These questions and more secrets are revealed in this adventurous, light hearted and fun contemporary novelette. Guitars. Hillbilly Music. Nashville, Tennessee. Fortune Brawling is the second story in The Fortune Series. Set in contemporary Nashville and the surrounding rural areas. The series chronicles the life and loves of Dallas Fortune. Writer. Author of the international best sellers, SEPTEMBER ENDS and FORTUNE CALLING. She has lived in Tennessee and Georgia her entire life, except for one ‘Lost Summer’ spent in Los Angeles. Currently, she lives with her husband and books in Midtown Atlanta, GA. She has a B.A. in History and English Lit, and an advanced degree from the University of Notre Dame. 2015 will find her writing Historical Fiction as Hunter Cookston. Her favorite color is red, and her favorite foods are hot peppers, apples and sushi. Jennifer Theriot hails from the Great State of Texas. She is a career woman, working as CFO of a Texas based real estate investment firm by day and does her writing at nights and on weekends. In her limited spare time, Jennifer enjoys being outdoors; preferably somewhere on a beach curled up with a good book. Spending time with family and friends, listening to music, watching a baseball game and enjoying a good bottle of wine are usually on her to-do lists. She’s mom to three grown children and ‘MiMi’ to three grandkids – all of whom she adores! Her best-selling Out of the Box Series, OUT OF THE BOX AWAKENING, OUT OF THE BOX REGIFTED and TOCCATA OBBLIGATO~SERENADING KYRA are currently available on Amazon.com . The final in the Out of the Box series, OUT OF THE BOX EVERLASTING will be released in 2015. Fabulous women who can spin a great yarn!